On July 23, 1985, Commodore kicked off a new era in its history with the launch of the Amiga 1000. Through the 1980s and into the early 90s, the Amiga built for itself a cult following and gained a reputation as a personal computer ahead of its time. Part of the story behind Amiga is the tale of two other brands: Commodore and Atari. In the early 80s, Commodore founder Jack Tramiel walked away from his creation and began to look for a new computer business. He acquired a struggling Atari in 1984 and, with the help of former Commodore engineers, developed a new line of Atari PCs. In the meantime, a group of Atari engineers lead by Jay Miner defected and formed their own company, a venture that would become Amiga, which in 1984 was acquired by Commodore with the intent of developing a new line of home and business computers to replace the beloved, but aging, Commodore 64. Fitting, then, that when the Amiga 1000 hit the market in 1985, its primary rival was seen as the Atari ST. The Amiga 1000 was, by all accounts, a system ahead of its time. Though it was powered by the then-common 7MHz 32-bit Motorola 68000 processor with 256KB of RAM (expandable to 8MB), it included three additional co-processors to handle animated graphics (codenamed Denise), memory management (Agnus), and sound (Paula). Because of this, the 1000 sported some serious graphics capabilities in resolutions up to 640 by 400 pixels, with 32 or 16 colors from a palette of 4096. Its AmigaOS operating system included a disk operating system called AmigaDOS and a desktop GUI known as Workbench, and supported preemptive multitasking. By comparison, Apple's Macintosh computers didn't introduce color support until two years later, and preemptive multitasking wouldn't arrive for the Mac until OS X in 2000. The Amiga 1000's impressive graphics, sound and performance capabilities, combined with the low price (with a color display it retailed for $1800), helped the Amiga stand out in an increasingly crowded market. Professionally, the Amiga pitched itself as a machine for developing multimedia, desktop publishing, and illustration. 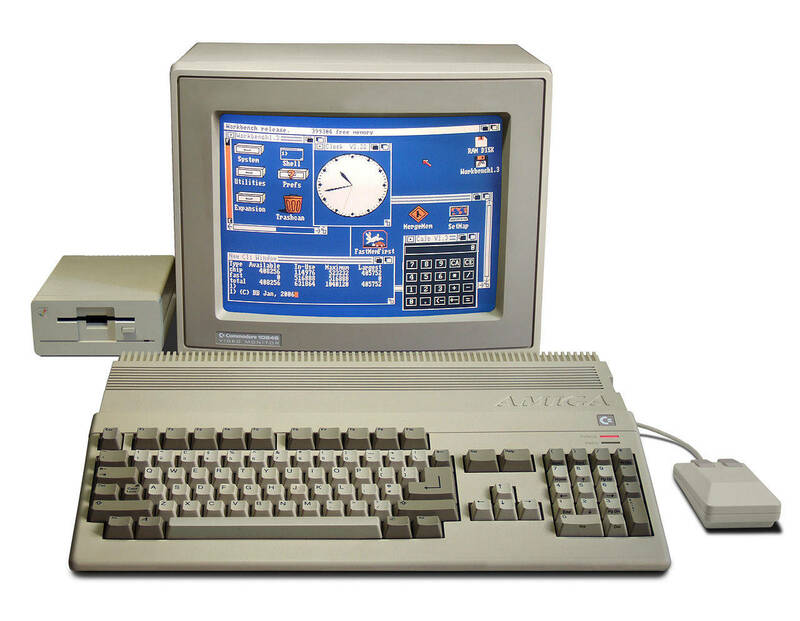 Perhaps most notably, the Amiga was the OS of choice for Video Toaster, the first home video editing and production suite. At home, though, the Amiga would become a legendary gaming machine. The introduction of the A500 brought a cheaper model for home use and helped to establish the Amiga as a top-notch gaming system. 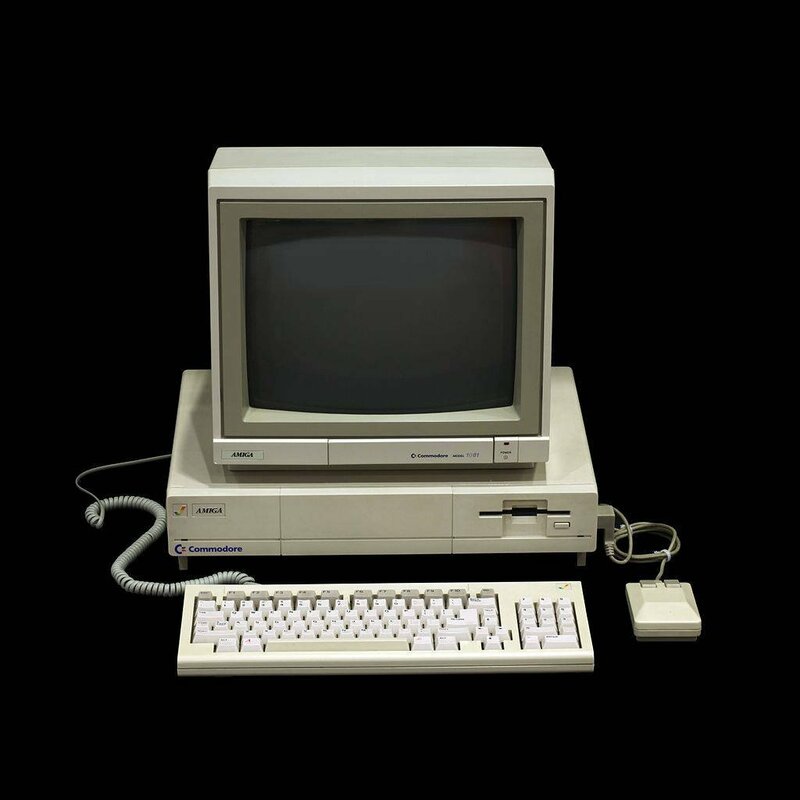 At $700, the A500 took up the mantle of Commodore PCs for gaming and, up to the end of the company, Amiga was hugely popular as a gaming system. In a day and age when most new machines are as difficult for users to open and upgrade as possible, Amiga not only helped users to open up and tinker with their machines, but even told them explicitly how the computer operated. Take, for example, this manual (PDF) for the Amiga 500. Not only does it include a detailed user manual, but a full library of shell and BASIC commands and even an appendix with a diagram of the I/O connector pins, motherboard schematics, and pin-by-pin diagrams for each of the custom controller chips in the machine. Granted, much more technical detail was needed in a manual in the pre-internet era, but Amiga went above and beyond in giving users details of the innards of their machines. This gave budding programmers at the time so much power at their fingertips, and the games and real-time graphic demos they came up with were incredible. Amiga carried on into the 1990s, but trouble loomed. As sales slowed, Commodore began to hemorrhage cash. When developers began to pull away from developing games and software for the Amiga, sales plunged and the company's fate was sealed. From 1993 until 1994, when Commodore declared bankruptcy, sales fell from $237.7m to just $70.7m. After Commodore folded up shop, the Amiga brand and OS were passed along from one owner to another with a few unfruitful attempts to revive the platform. These days, AmigaOS lives on as a niche OS for PowerPC systems with a small, but dedicated, following.